That’s right folks! I know many of you have been waiting for this and now…it’s coming! 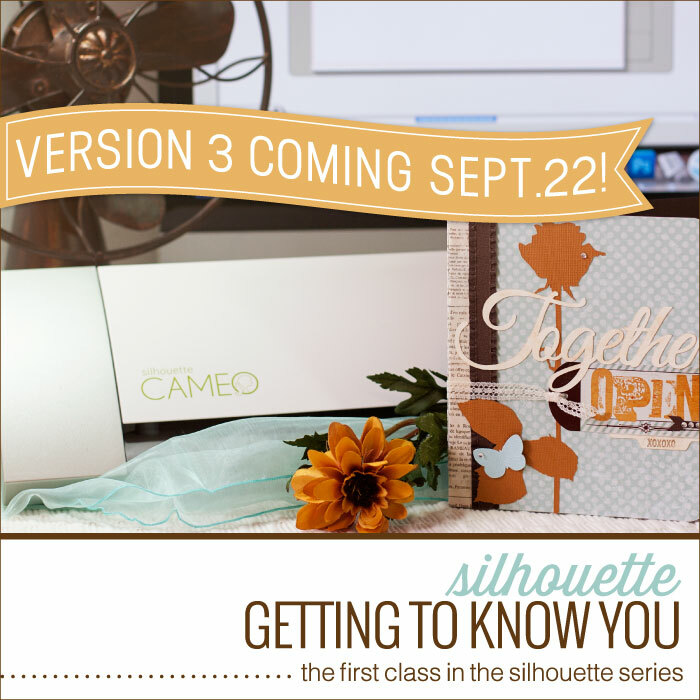 The Getting To Know You Silhouette Class will be available using Silhouette Studio version 3 on September 22. Can we get a yahoooo?!!! Here are a few Q&As. Q | If I have previously purchased this class–whether at KBS or JessicaSprague.com–will I already have access to this class? Q | Is the overall content and project the same? A | Basically yes. Much of what we did in the original class is still relevant and fun, so it will remain the same. But we’ll cover the basics of new enhancements or features in the new version too. It’ll be a great overview of what the software can do, especially if you’re just starting out. Q | Will I have access to the class for the old version if I buy the class now? Can I watch version 2 videos now? Q | If I already own the class at KBS, how do I access it once it becomes available? A | You will access it just like you normally would through your Getting To Know You classroom link. You will have a choice to use the Version 2 or the Version 3 set of videos. Those accessing the class via JessicaSprague.com will follow the links there. You can save 20% on the new, lower-priced, class. The sale price is in affect until the first day of the new class. Class prices in the combo packs have also been adjusted to accommodate the lower price and the sale price for this one class. You can also get the kit for free if you purchase a combo pack through Sunday. It is the perfect addition to the album we’re creating on family and/or being together. does studio version just mean doesn’t have the designer upgrade on the cameo? You don’t need the Designer Edition to do the class, but if you do have it, it will all still apply. :) We just won’t be covering any of the DE features. THANK YOU, Kerri! I’ve been reluctant to upgrade to the new software, because I wasn’t sure if I’d be lost with all the changes in the new version. I am not very tech savvy and your classes have been a fantastic resource in helping me get the most out of my Silhouette! I find myself referring back to them all the time. I’m counting the days till Sept 22! This is awesome news. It’s so nice that I won’t have to purchase the class again to get the updated information….this is AWESOME of you! So if we have purchased the combo pack in the past ( i have 1-4) do we still get the All In The Family kit free? Thank you for all you do!!!!! and was so frustrated and having so many problems, that I downgraded back. Thankfully, that was an option. Anyway, I’m so excited that you are updating the class and making it available to us that took it originally. I’m so happy about this! Been waiting to re-download v. 3. (Yes, I had it early on and reverted back!) So if we already purchased the earlier version of this class, we do nothing, right? Awesome Kerri, I purchased this class over at Jessica’s… so how would I be able to get into this class.. so excited. Still haven’t completed any of your classes, BUT I have them all. Some day I will have the time. If we purchased this through Jessica Sprague (I purchased the first two Silhouette classes there), will we have access to the updated class here or there? This is so timely, I was just about to go back and review the lessons again. I purchased the classes from Jeassica Sprague also just before you moved. I sure hope that we will have access to them. I have not downloaded v3 yet. I am waiting to make sure it is safe to do so. Yes, as was stated in the Q+A, if you purchased it at JS.com, you will have access to the updated version over there as well. Awesome news! I took your earlier classes at Jessica Sprague.com and the newer ones here. I didn’t want to update until I knew more about the new version, especially with all the problems. I always recommend your classes to all my Cameo friends. You are the best! Thanks Kerri for the upcoming Studio 3 lessons in this Getting to Know You class. I have loved the other classes I have taken from you and just purchased this one for the new info on Studio 3.I am one of the enthusiastic users of the new upgrade, so much goodness. I can’t wait to learn more of you in Sept! 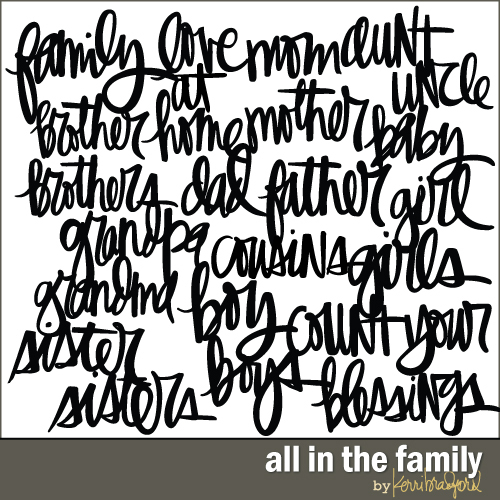 PS thanks for the beautiful, wonderful Sll in the Family kit! This is such good news and you are very generous for allowing us access to the new material if we’ve previously purchased the v2 class!!! I’ve been waiting for you to have a class (or just give your blessing to Version 3) before I upgraded. Thanks so much!!! Print+Cut is mainly covered in the second class, Oh The Places You Will Go. So I would suggest that one. I’ve heard from many people that felt like they had a good understanding of Silhouette Studio and still took the first class (GTKY) and learned a ton. It’s hard to determine what level you are, but if what’s listed in the class description sounds like some of what you’d like to see, then I’d sign up for the class combo 1+2. While projects done in the class may be ‘scrapping’ related, anything that you learn can be applied to any project. Hi Kerri I am confused…so I took the class when it first came . I can take it again…no charge and it includes the new features but NOT any of the DE features? ….and I still have to register correct? No, you do not need to register again. This is the same class you’ve taken, just updated using version 3. It will be accessed via the same classroom link that you already have. And just like the first go around with GTKY, it does not include the Designer Edition features. Looking forward to the version 3. Thanks for providing this for us Kerri!! Your classes are the best!! I had been disappointed that there wasn’t a class for v3, so now I am so excited to see you have one, and that it will be available to us who purchased GTKY. Your explanations are fantastic, and I can’t believe how much MORE there was to learn, even for someone like me who had been using my Silhouette for a year before I took your classes. After I bought the first one I was hooked and had to get the rest of them! Wow! What a great deal! Less than $17! I shared this with a Beginning Silhouette group on Facebook. I love the features of version 3 and will be glad if more people can get comfortable with it! Thanks so much for sharing your know-how!!! Kerri, Thank you, thank you, thank you!! I purchased the bundle you offered after the Lain Ehman Scrapinar thingey. It is one of the best crafty purchases I have made. Your style and the clear graphics make everything so understandable. I can’t wait for the new GTKY vids. Thinking about them make me smile! I’m very excited about this updated version as there is a bit of a learning curve with this version 3 as you know…I purchased this and Oh the places you’ll go through Jessica Sprague site and so I went over today (August 23/14) but it still says you need version 2.5 and I don’t see any links to updated videos/info…could you tell me if the links have been provided elsewhere, perhaps they are not available yet or more likely I’m blind and totally missed them (LOL)? Any help would be greatly appreciated Kerri! Loved those two classes and will purchase more through your site now that I have found it! This class should be available to view on JS.com after that. This is wonderful. I also bought Getting To Know You and Oh the places you’ll go on JS.com when they came out. I learned much with both of them so I am sure I will learn much too with the newer version as I have not even played yet with v3. When will the classes be available to us? Hi Kerrie, the version of this class available at Jessica Sprague is still the old one. Have a missed an email, post or something that would explain this. Thanks for your reply Kerrie. Yes I probably did use a different address back then and yes I do have an account at KBS (under this email). The email that I used at JS is now my husband’s so I don’t want to list it here. Happy to send it to you privately. Hi Kerri. Now you are home are you able to set me up. I am a KBS member and would be happy to send through my previous email address but as it is still in use by my husband I would rather do that privately. Regards Michele. Send me an email at kerri@kerribradford.com and we’ll get ya all set up.